Posted on 13, April 2016 by EuropaWire PR Editors | This entry was posted in Automotive, Italy, Sports, United Kingdom and tagged Andy Soucek, Bentley Motorsport, Blancpain Sprint Series Cup, Maxime Soulet. Bookmark the permalink. 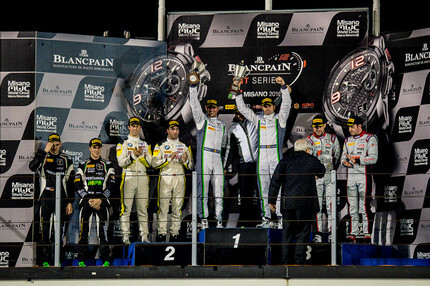 Misano, 13-Apr-2016 — /EuropaWire/ — Bentley Motorsport’s works team made its Blancpain Sprint Series Cup debut at Misano, this weekend, and won the first race of the event, putting the #8 Bentley Team M-Sport Continental GT3 on pole for Sunday’s main competition. Andy Soucek (ES) and Maxime Soulet (BE) chose to start Saturday’s one-hour night race on slick tyres, while all but one of the other 38 competitors started on wets, a decision that ultimately won Bentley Team M-Sport its debut Sprint Series Cup race. The victory secured pole position for main race and handed Bentley eight valuable points towards the Blancpain GT Series and Blancpain Sprint Series Cup titles. Sunday’s main race was not so fortuitous for the British team. Running in third place, the #8 Continental GT3 of Soulet was tapped from behind and sent spinning. An hour later, following a valiant charge, Soucek crossed the line in P11. The #7 Continental GT3 of Steven Kane (GB) and defending Sprint Series Cup champion Vince Abril (MO) started the main one-hour race from P20 and finished in P17. The Blancpain GT Series continues at Monza in a fortnight for the first of five endurance races. Bentley Team M-Sport will continue with its two Continental GT3s and the drivers will be joined by Guy Smith (GB) and Wolfgang Reip (BE).